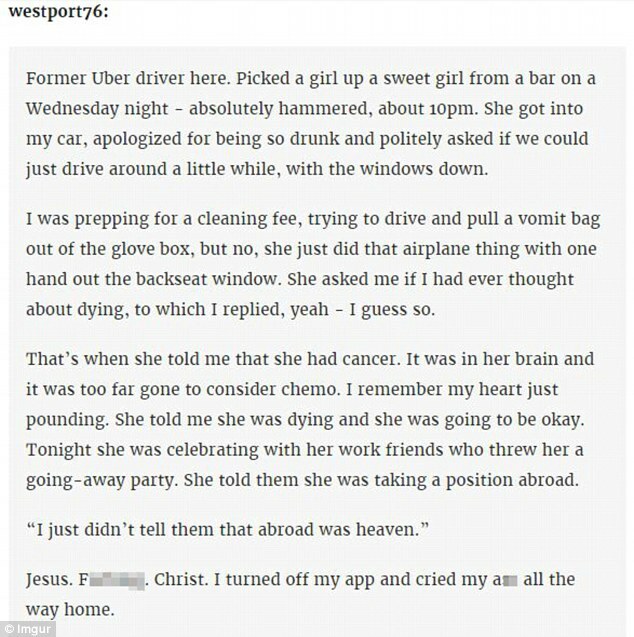 What is the saddest thing a passenger ever told you? Crying Passengers? What do you do? What is the most eye-opening thing a passenger has ever said to you? I once had a fare who wanted me to take her to an alley behind a 7-11 so she could see the spot where her brother was murdered. Damn. That's dark. Did you just, like, drop her off there? Or did she just want to see it and drive away. I picked her up at a hotel she wanted to see the spot for 5 minutes and be driven back to her hotel. She came to town to do this. I was driving for Yellow Cab so I had the ability to turn of the meter on the wait time. It was the least I could do. Yeah it made me pretty sad. People do this for closure, right? I think psychiatrists sometimes suggest this. It's a way to say goodbye and let the reality sink in. I once picked up this one girl from market basket (she must have worked there as she was in uniform) and she was sobbing, like hands on her face sobbing. I was praying she wasn't my ride as I was pulling up and when she started walking towards my car my heart sank. I didn't want a 20 minute ride with a girl crying uncontrollably. She got in, I kind of ignored her at first but then I asked if she was ok and she was literally cry-heaving in the backseat. She sputtered out that she just found out her dad had passed away. She started spilling everything and while it was a little hard to understand her through the tears I got the impression that the last time she talked with her dad they had gotten in a big fight. You could tell the guilt and remorse was just eating her up. I still think about her almost 2 years later. I hope she is doing alright. This famous thread must rank up there somewhere. ...that I will get a bad rating on my ride. LOL. That she was a Trump supporter. ...and she believed that he was making america great again. Once I had a passenger who was going on about her mom being deported. Oddly, she wasn't all that sad, more matter of fact. While she wasn't that sad, I was, sad for humanity. I have quite a few of personal senior customers who have told me that their child/ children can't wait to collect their will and/or throw them into a nursing home.